Can I proudly present this wonderful humbug to you??? It felt kind of funny to be stitching a wintery penguin today here in West Texas Town as the temperature reached 80 degrees, but stitch (and finish) him I did. Behold, "Jingles the Penguin" from the JCS 2007 Ornie issue! I didn't have all the floss and embellishments called for so Jingles doesn't have a button for a nose, a bell at the end of his Santa hat, or a fuzzy red scarf, but I think he is cute all the same. I've been finished these for awhile now but have neglected to post any pictures. The first was a freebie I received with an order from San-Man Originals. 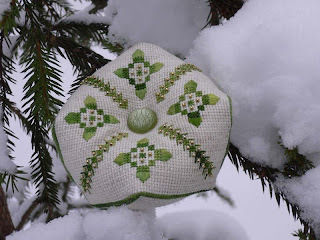 The second is from the Dec 2007 JCS by Angie Williams of Sweet Peas Designs. 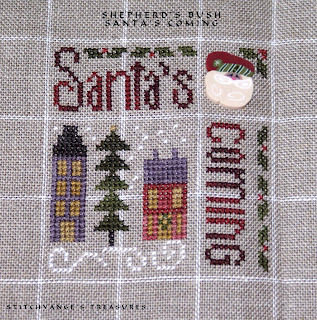 The manger is adapted from Graphworks Mini Motifs for Christmas Vol 1; the D design is adapted from Alma Lynne's Christmas Alphabet; the tree is my own design. 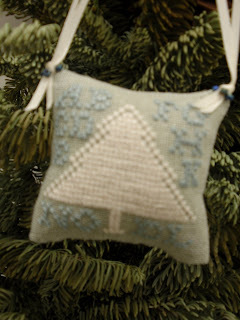 This wasn't my original choice for my ornament this month but when I received this I just had to stitch it! 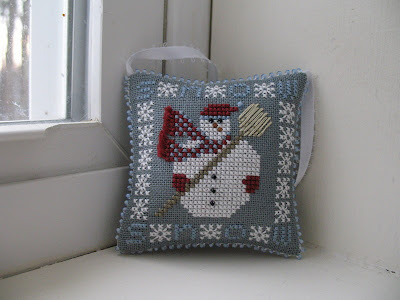 I bought it as a little kit from Needlecraft Corner. 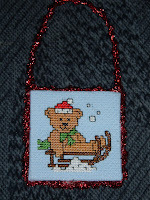 I completed my 5th design from Christmas Past, Book #51 by Prairie Schooler. Labels: Blackbird Designs, Carol S.
The heart in hand motif symbolizes charity. 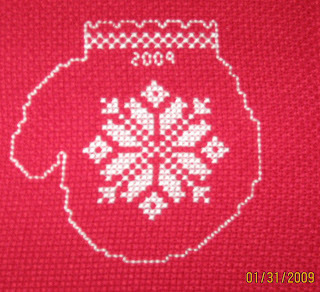 My first ornament for 2009! Freebie design from Bent Creek called swirlygig. link for design can be found on my blog. 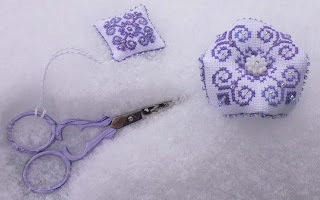 Labels: Bent Creek, freebies, Laurie W.
Happy February to you all.....This is all inspiring to keep stitching. Sometimes I like to switch from the traditional colors to something soft and wintery. 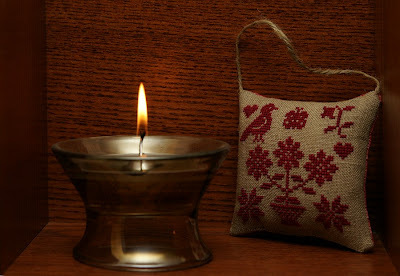 I had this piece of Red Fabric left over and had to think of something to do with it! It will definitely hang on a door in December. 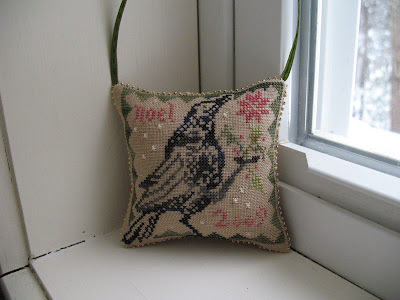 I'm slowly working my way through Christmas Past, Book #51 by The Prairie Schooler and got this cute little bird done. This is my February ornament. 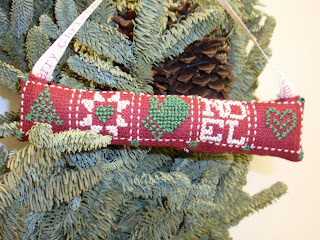 It is for my daughter who chose the glitzy tinsel braid over the pretty ribbon I had bought. A little Mouseloft design. 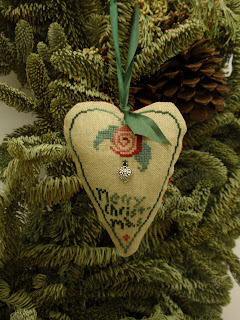 Here is my Jan. ornament finish. I finished it Jan 31! I think my extra ornaments that I give away will be mittens. That could change ...just like this OHIO Winter weather! 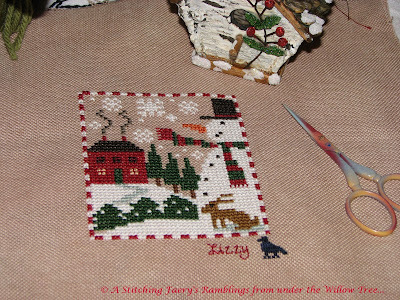 I couldn't resist this cute little guy from the Prairie Schooler booklet "Christmas Past" - Book #51. He's stitched on 28 count Khaki lugana using the DMC called for. 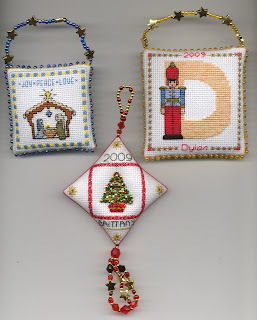 I was able to stitch 2 ornaments in January. Designed and stitched by Alexandrina.